Today, Speaker of the House Paul Ryan announced that he would not seek re-election. The decision by Paul Ryan comes on the heels of many other revelations from prominent Republican incumbents, such as Senators Bob Corker and Jeff Flake and Representatives Darrell Issa and Ryan Costello, that they will be gracefully retiring in January. So far, 54 members of Congress have opted not to seek re-election, 17 of them Democrats and 37 of them Republican. The significant turnover promises that the midterm elections will be fraught with tension, conflict, uncertainty, and many surprises. It is only fitting, then, that CCLP teamed up with the USC Jesse M. Unruh Institute of Politics to host a panel on Tuesday, April 10 to discuss party politics, drama in Washington, and the ongoing campaigns of 2018. 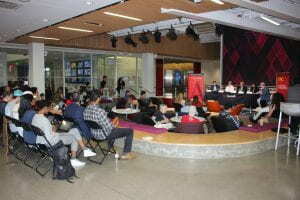 The event was called “Midterms: The First Lap” and it took place in the forum of Wallis Annenberg Hall. The panel featured Seema Mehta, political writer for the Los Angeles Times; Jill Darling, from the USC Center for Economic and Social Research; Matt Klink, President of Klink Campaigns, Inc.; and Dan Schwerin, former speechwriter for Hillary Clinton. Although Unruh Institute Director Robert Shrum said on stage that he wanted to leave the predictions game behind after the 2016 Presidential election, the night was full of conjecture as the experts tried to prophesize how November would turn out. The start of the conversation centered on how President Donald Trump has changed the strategies of both the Democrats and the Republicans. “If I was a Republican candidate, I would be real upset with how Trump’s trade war and his attacks on Amazon have jittered the market,” started Schwerin. Mehta argued that if Marco Rubio or John Kasich was in power, instead of Donald Trump, the Republicans would be in a much better position than they are now as they head into an intimidating election season. All panelists agreed that the wins of Conor Lamb, Doug Jones, and Ralph Northam are evidence that voter passion is there, especially among young Democrats. Panelists soon shifted to talking about which issues they believed would play a major role in voter decision-making in November. Klink claimed that “trade, especially in the Center of the country” could change voters’ minds, especially after Senator Jodi Ernst (R-Iowa) so publicly warned that China’s tariffs would disproportionately impact the Midwest. The panelists traded opinions on how Republicans in 2018 can balance firing up their base with fairly radical rhetoric on immigration and keeping the loyalty of suburban moderates. Schwerin pointed out that the only achievement the Republicans can really point to is the tax cut, which he said is “still unpopular, especially because it includes the unpopular changes to healthcare.” Shrum wondered aloud whether the economy would help Republicans pick up seats, while Darling argued that too many people feel like the country is in crisis. Other topics of the night included Nancy Pelosi’s reputation, the prospects for gubernatorial candidate John Chung, and the role that education (after the strikes in the Midwest) should play in American politics. CCLP looks forward to re-visiting the 2018 midterms in the fall, through programming in partnership with the Unruh Institute and in Director Geoffrey Cowan’s journalism classes. Check back in the late summer for more information on plans for the fall.